On day three of the second Test at the Eden Gardens, India scored a total of 297 runs for the loss of six wickets -- of which he alone scored 148. More to the point, he took the Australians head on and made them back off. 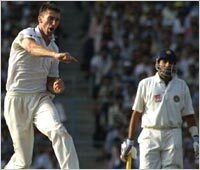 When McGrath went round the wicket and bounced him, he hooked and pulled, consistently, till the quick bowler gave up. When Warne went round the wicket with a packed leg field, he used his feet with balletic grace and showed how the leg-spinner could be tackled. When Jason Gillespie, an excitable character at the best, snarled and cursed, he glared back, then drove and cut him out of the attack. And finally, he went after Kasprowicz, and put that bowler's first innings performance in perspective. Any and all of the above is deserving of applause. But that is not why you need to stand up for VVS Laxman today. The real reason goes back to the fag end of the Indian first innings. Venkatapathy Raju fell, trapped LBW by a reverse-swinging ball of full length, the Indian score was 129/9, and another defeat inside three days was imminent. And then Laxman, in company of Venkatesh Prasad, produced a last wicket stand of 42 runs. More importantly, he showed that it is not only Steve Waugh who can bat responsibly with number 11. Farming the strike initially, talking Prasad constantly through his nerves, exhorting, encouraging, gradually allowing him more of the strike once the tailender grew in confidence, Laxman demonstrated to his mates back in the hut what some application, some heart, some pride, some self-respect, and some commitment, could achieve. And it is for this that we need to stand up for this man, and applaud till our hands hurt -- we thought, a day before, that these values were dead. Laxman showed us today that some embers remain -- and hopefully, the applause of a nation will fire him, and his mates, into fanning those flames alight again. I know I know I know. "There he goes again, one good innings and he sings hosannas..." Yeah, right. But then, when we condemn the bad, is it not fair to be equally quick to applaud the good? Laxman stood tall today -- it is only fair that he be acknowledged, and appreciated. Only an incurable optimist would have, at start of play, anticipated the game going into a fourth day. But out in the middle, Laxman seemed to have other ideas as he cajoled first Raju, then Prasad, into keeping him company. And suddenly, stands that had been half-empty at the start of play began slowly filling again. The Indian innings ended in a rather unfortunate fashion. 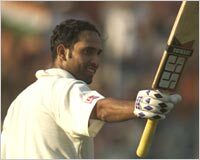 Laxman having completed his 50 and seemingly intent on whittling away the deficit as much as he could, swept Warne on line outside leg. The shot missed, the ball hit the arm above the wristband, climbed onto his shoulder and richocheted to slip. Neither bat nor glove had come in contact with the ball -- but the umpire raised the finger, and that was that. The follow on was enforced. Das looked good from the first ball he faced. At the other end, Ramesh cracked 30 off 43 balls, with six fours -- an innings that only reinforced the feeling that he needs some time on the bench to rethink his game, and his attitude. Ramesh is a stroke-player at any and all times, which is fine. But no team wants to see its number one stand in place and keep slashing outside off, time and again putting the ball just over the heads of the slips. True, this time, Ramesh got away -- but there is a bit more to cricket than a crapshoot, and an opener who puts so little value on his slot as to treat it like a lottery needs a drastic attitude overhaul. Warne took the left-hander out in the post-lunch session, first getting Ramesh used to defending to leg breaks turning sharply in to him, then producing th delivery that, with a touch of overspin, hurried through straight on the angle to take the edge and give the viewers an idea of why Mark Waugh is rated one of the best slip fielders of our age. The ball was dipping to his right, and the nonchalant ease with which 'Junior' slipped his hand under it and snaffled the take made it all look ridiculously easy. Das and Laxman (promoted, quite rightly, to number three at the expense of Dravid) then settled into a partnership that made it all look ridiculously easy. Laxman was the aggressor, playing with a fluency that continued on his first innings effort. Das was the accumulator and -- rare in an Indian -- batted with an eye as much on the single as on the boundary line. Between them, they handled all that the Aussies threw at them, and the crowd, realising that they were watching a fightback, was just beginning to get behind them when Das went in the most unfortunate way possible. Getting nicely into line to a Gillespie delivery, Das shaped to play to fine leg, connected sweetly, and took off -- only, his back foot had gone back that one centimetre too much, for the heel of his boot to touch middle stump and disturb the bail. The dimunitive opener had batted with calm good sense throughout, handled pace with grace and the spin of Warne with enormous aplomb, and deserved more than such an unfortunate end. Sachin Tendulkar came to the wicket, for once with a healthy double digit score on the tins. The Gardens set up the kind of roar that even Saurav Ganguly is not favoured with on his home ground. 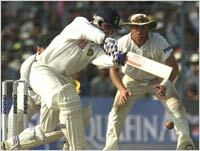 Facing him was Shane Warne, and Tendulkar promptly rocked back and slammed him through cover for four. Warne was taken off, McGrath brought on -- and Sachin played out a calm, defensive over. But there was something about his tenure that did not inspire the kind of confidence he normally gives; there was something about his body language that was markedly different from Mumbai, that makes you wonder what is on his mind. It is hard to point to a single instance, unless it is the reverse swinging yorker that he flicked square -- at immense risk, that early in the innings -- for a brace. But it was there, and it came through in the way he drove at a lifting Gillespie delivery outside off, without getting into line, for the ball to clip the edge through to a delighted Gilchrist. Next up was Saurav Ganguly -- facing the two quicks, with four slips, two gullies, one short leg and one short cover in place. The Aussies were clearly determined to pile on the pressure -- and this again brought out the best in Laxman. Time and again, he kept strike, or took off the blocks quickly from the runner's end to allow Ganguly the luxury of a first ball single, allowing his captain to spend time at the other end and get his confidence back while he himself took on the bowlers. Once Ganguly got his eye in and his feet moving again, a purple patch followed. Like Laxman, Ganguly too got into combative mode, tucking McGrath off his hips, crisply square driving and cutting Gillespie for fours after being on the receiving end of the bowler's snarl, smashing Warne through the covers, and straight driving Mark Waugh with aplomb. It looked like the Indian skipper was finally getting his act together, when he got suckered into a little exchange (albeit with both participants smiling) with McGrath. The very next ball saw McGrath go over the wicket to the left-hander and pitch one on off, seaming a touch away. 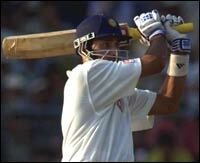 Ganguly squared up and hung his bat out, for the edge through to Gilchrist to end what was developing into a nice knock. Rahul Dravid came in at the unaccustomed position of number six (nice to see, incidentally, that the Indians did not send out a night-watchman for the final seven overs of the day) and looked in decent touch as he in company of Laxman saw India through to stumps. On the first two days, the post-tea sessions had been disastrous for the batting sides. On day three, 35 overs produced 132 runs for the loss of just one wicket -- a complete turnaround, and a brutal reminder of what could have been possible had the Indians batted with more application in their first innings (which, you will remember, ended inside 59 overs). As Laxman walked off, with 109 runs against his name off just 183 deliveries, the Eden Gardens came to its feet. More significantly, Steve Waugh led his mates in applauding a player who had stood up, throughout the day, to everything the Aussies could throw at him. One feature of his innings today was his wristy play, on both sides of the wicket, to the pace bowlers that brought back memories of Laxman's batting icon, Mohammad Azharuddin. But the most significant fact was his play to Warne. When it was short, he was quickly back to pull. When pitched up, he drove with panache. And when Warne went round the wicket, curving the ball in from a foot or two outside leg stump, Laxman kept dancing down the wicket to thump the ball out on the on, or go inside out to drive on the off. True, the field was set immaculately by Waugh, and many of those shots went to the fielders. But for once, someone was consistently playing Warne off the square, challenging each line the leggie bowled -- and for the first time other than when bowling to Tendulkar, the ace leggie was seen (after being creamed for consequtive fours through midwicket) standing with his head down and hands on his knees. That came as a marked contrast to how the Indians -- especially Dravid, the previous inhabitant of the number three slot -- played Warne. Time and again, the Indians kept within their crease and seemed content to push their pads at the ball -- thus allowing Warne to pretty much dictate proceedings. Once Laxman (and to an equal extent, Das) began going down the track, the same leg side line that looked so lethal, proved completely ineffective. It goes back to a lesson that Dravid, and a few of the other Indians, could learn with profit -- out in the middle you play the ball, not the bowler. Dravid in the first innings padded at everything, even rank bad balls. Laxman and Das, by refusing to let Warne dictate, consistently converted even good balls into runs -- and left the ace leggie with figures of 20-2-87-1, that one wicket of Ramesh coming before Laxman and Das got together to muss Warne up a bit. Question is, what took the side so long for wisdom to dawn? India are still 20 short, with the last recognised pair at the crease between the Aussies and the Indian tail. It is possible for India to wipe out that deficit, then put another 250 on the board, and really push the Aussies against the wall, in the fourth innings. It is also possible for me to walk on water, and then convert a jugful of that same water into sparkling champagne. But that is not the point, really. The point is that there is a nation out there, waiting for this team to show spirit for a fight. Regardless of the outcome, I suspect the fans will settle for a good fighting display here. In passing, one other thought about VVS Laxman. When he is dropped, the selectors point to his failures. Here are a few of his scores that need to be kept in mind -- a fighting 51 against South Africa in Ahmedabad in November 1996, a combative 56 against the West Indies at St John's when the rest of the Indians resembled a badly constructed house of cards, another 64 at Kingston, a 67 against Pakistan at this same venue, a 95 against Australia again at the Gardens in 1998, 167 against Australia at Sydney, and now 59 and an unbeaten 109 nine here, again versus a strong Australian attack. That puts me in mind of a question I wish the selectors would answer -- to wit, when will they give Laxman a chance to pile up double centuries against Zimbabwe and Bangladesh? Or is Laxman one of those doomed to be dusted off and brought into battle against the big guns, and to play with the realisation that against weaker opposition, he will be dumped while other pampered darlings climb up the Pepsi and Ceat ratings charts? And finally, this. As part of the run-up to this Test, we had carried an analysis piece, titled Bat on or Bust!, highlighting the importance of playing the long Test innings. We had made the point that if the batsmen were prepared to hang in there, then runs would come, even against an attack as strong as the Aussies. Consider this -- the Indian first innings lasted a total of 58.1 overs -- just 49 balls more than a normal ODI innings. India scored 171 -- a laughable score even by ODI standards. The second innings has thus far lasted 75 overs -- and produced 254 runs against the selfsame attack, on the selfsame pitch. So just what was this team doing in the first innings? In the first innings, this team collectively faced 361 balls (sundries included). 300 -- three hundred of them were not scored off! The innings boasted 26 boundaries, and just 21 singles! And overall, 171 runs came off just 61 scoring shots! Contrast that with this set of statistics -- Australia's first innings total included 95 singles, beside the 57 fours and 6 sixes. How many more times, for how many more years, will everyone from the experts to the analysts to the reporters to the man on the streets have to keep talking of the value of the single before this team will actually listen, learn, and put it into practise? Why is common sense the most uncommon commodity in India's cricket?